Today a frontal system originally forecast to roll through here later this afternoon has brought some showers and an offshore wind into our area @ midday. Seems as most of those showers have now cleared out but the sky remains gray, to me a pleasant change from yesterday’s scorcher leading into this presently slightly cooler afternoon. That sun will be back tomorrow and the thermostat will be several (4 to5) degrees lower if the forecast holds true. SPF 50 and a t shirt never the less. 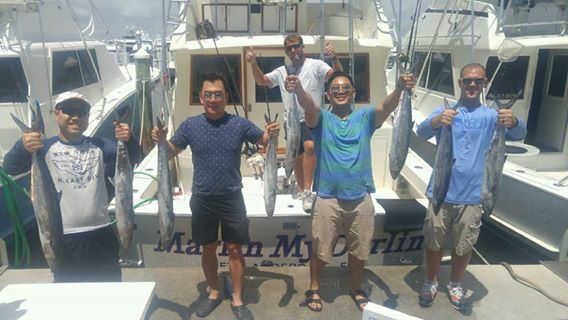 Kingfish are now back in the picture in ever increasing numbers and we are finding them in water from 90 to 120 feet. The bite has been good in both the clear blue as well as the greener tinged water that often yields more Kings that the clearer water. Nice to see them around. Expect to get hammered by the Bonito on many days when you are in there with those Kings. Blackfin Tuna remain just off the edge. Slight current edges and structure have held them the best, but some are as always wherever you find them, which is wherever the bait is, and that can change in the course of the day, not to mention overnight. They too are unfazed with clarity as greener water is holding some good ones. 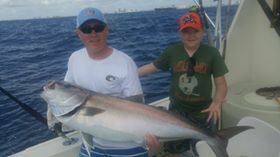 Big fish out front short of way offshore Swords remain the Amberjacks and Sharks. 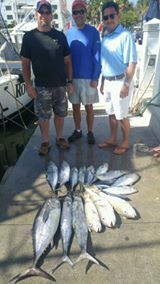 Really nice Amberacks, and the Bull Sharks have left us alone these last several charters. We had one Jack, a 50 pounder, really get extremely jittery and erratic about a third of the way up yesterday and we were expecting him to be stolen, but he never got taken (that’s a good thing because his day ended on a happier note as we released him after some quick pictures). But as long as the numbers of Jacks are here on the wrecks the Bull Sharks will be remain regular visitors. Big strong 9+ foot Hammerhead two days back for us caught and released while targeting Sharks out in 400 feet of water. That is a good shark as most have been smaller. 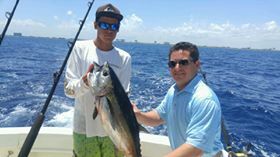 Golden Tilefish are snapping in 700+ feet of water, and that meat being just as sweet and firm as ever, but what was some pretty good Mahi-Mahi fishing a couple of days ago has fizzled even prior to the wind shift with this front. Wahoo remain at the top of the wish list, wherever they are. No bites from them, but good numbers of the fish listed above.